This tendon is a hamstring tendon, but one, which can be extracted without an essentially long loss of power and function for the knee joint. The advantage of this technique is, that the incision is smaller and patients mostly complain less about the post-operative pains than the ones with a BTB-transplant. The typical pains at the extraction point of the bone blocks and problems like a fracture of the kneecap and a tear of the patellar tendon do not appear. The disadvantage of this operation technique is, that the patients cannot return as fast to their original training program or their original load. Moreover the internal rotation of the lower leg is probably a bit weakened. Another disadvantage is, that in 10-20% of the cases (according to different references even more) a nerve gets damaged – this leads to a mostly temporary numbness of the outside of the lower leg, occasionally even to burning nerve pains. The surgery starts with the arthroscopy, thus the endoscopy of the knee joint. Possibly existing damages of the meniscus or the cartilage will also be treated and the remains of the torn cruciate ligament will only be removed, if they bother. In order to preserve the endogenic receptors, the rest of the cruciate ligament shall be left as much as possible. Afterwards the bone in the insertion area of the cruciate ligament will be brushed up. In contrast to the BTB-transplant, only a 3cm long incision below the kneecap is necessary, through which the semitendinosus tendon is extracted and through which a tiny bone channel in the lower leg is drilled. Via the „all inside“-technique a so-called flipcutter is brought in, through which one can drill backwards, which means that only as much bone is drilled out as necessary for the inclusion of the transplant in the lower leg. Afterwards the thigh is also drilled out from the side of the joint, but again only as much as necessary. Subsequently the transplant is brought in and fixed on its position via a specific technique including two lassos with tiny attached buttons made of titanium (ACL-TightRopes). This method includes no bioresorbable screws, which can cause problems even years after they have dissolved (cysts of decay). The tiny titanium buttons come to rest on the outside of the bone, so that there is no external material inside the joint and bone. Over the past few years the double bundle technique experienced a temporary hype. It was propagated to replace both cruciate ligament bundles with 4 own drill channels. The follow-ups, however, displayed, that apart from a slight improvement of the rotary stability there is no advantage over the common single bundle technique. Obvious disadvantage: 4 drill channels make 4 fixations (screws, anchors, plates etc.) necessary, which can cause problems for another surgery. ​The tendon, which is used for this technique is the kneecap- or patella tendon, thus the tendon, which connects the kneecap with the lower leg and which has therefore an important function for the extension. Due to its short length this tendon must be extracted with two blocks of bones out of the kneecap and the lower leg. The advantage of this technique is, that the bone blocks heal very quickly, so that the patient can return to his training program a bit earlier. The disadvantage is, that approx. 20% of the patients complain about pains in the extraction point of the bone blocks (anterior knee pain), especially when doing work on their knees. Also complications like kneecap fractures and torn tendons are recorded. 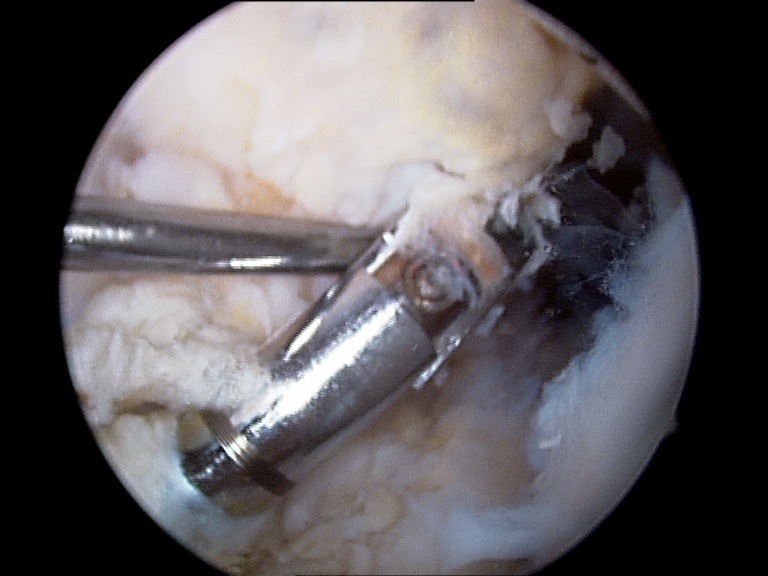 The main problem, however, is, that long-term studies apparently prove, that after 20 years nearly all patients with a patella tendon transplant develop a more or less distinctive retropatellar arthrosis (cartilage damage behind the kneecap). The surgery starts with the arthroscopy, thus the endoscopy of the knee joint. Possibly existing damages of the meniscus or the cartilage will be treated. Afterwards the rests of the torn cruciate ligament will be removed and the bone in the insertion areas of the cruciate ligament will be brushed up. Then many surgeons tend to perform a large cut along the tendon so that the complete operating area becomes visible and the tendon can be saved. As this often leads to injuries of the nerves including numbness, I prefer two small incisions over the bone blocks and save the middle part of the tendon and the parts of the bone (approx. 1,5 cm long and 8 mm wide bone blocks out of the kneecap point and the shin head) with a minimal invasive technique (key hole technique). Afterwards the drillings for the inclusion of the bone blocks in the area of the former insertion and origin of the anterior cruciate ligament will be performed, then the cruciate ligament preparation will be inserted and via special non-resorbable screws (interference screws made of PEEK) fixed on its position. An immobilization of the knee joint is necessary only in case of concomitant injuries. 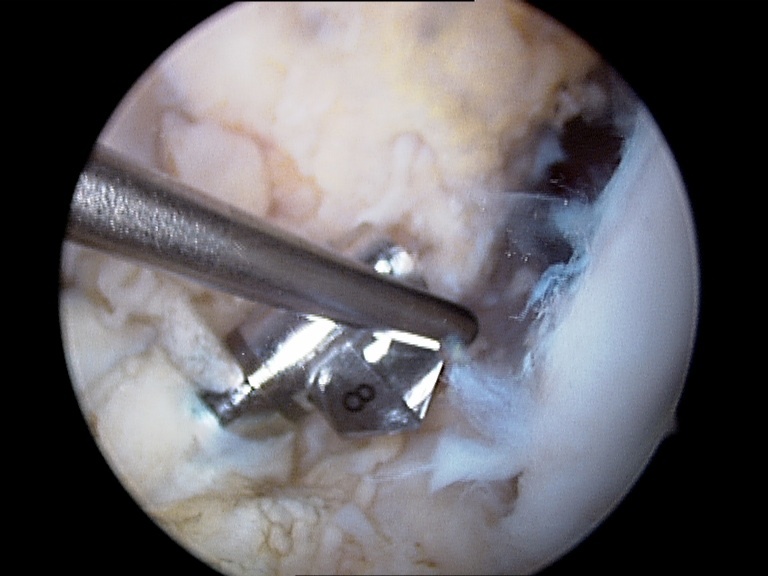 This part of the tendon located above the kneecap is fondly used for revision surgeries and can be extracted with a bone block out of the kneecap, too. Recently it is taken as a replacement for the patella tendon and used for the first operation instead.